Should we conserve nature at the expense of the economy? Specifically, should we risk the collapse of major industrial sectors to save species? We’ve created modern buzzwords like “sustainable development” and “new conservation” to explain multiple-objective conservation programs because many argue that conservation is only sustainable when it aligns with other economic, social and political goals. I’ve even argued this point-of-view in the past. Society is petrified of putting an end to the exploitation of nature because we worry about the terrible consequences of dismantling the modern-day economy. Should we worry about the impending threat of unemployment, debt and unpaid mortgages if we were to choose conservation instead of consumption? The short answer: No! Well, at least not if the past is any predictor of the future. 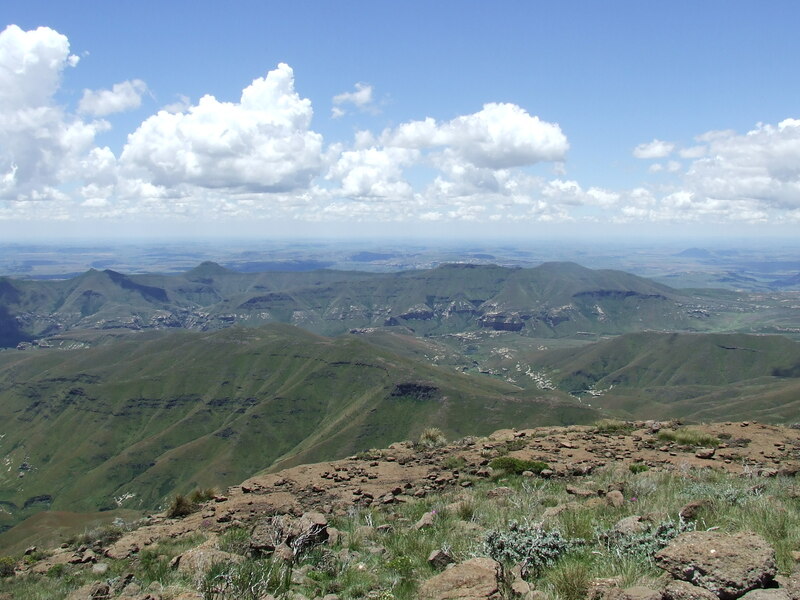 The history of Golden Gate Highlands National Park on the South African border with Lesotho is the perfect example preservation taking precedence over exploitation. This recollection is based on a fascinating old monograph (in Afrikaans) about of the establishment of the park written by the historian A.P.J. van Rensburg in 1968. Alongside tales of dinosaurs, cannibals, farmers, and wars between the British, Boers and Basotho, the manuscript grounds the present-day biodiversity crisis in a historical framework. Some of the same problems faced today, are no different to those faced more than a century ago. We can perhaps learn something from the past? Central South Africa was teeming with wildlife in the 18th and 19th centuries. There is, for example, the retelling of the death of Paul Maré (1767-1838), who was so astonished by sheer number of antelope grazing in the region that he stood up on his wagon to get a better view. He was then fatally injured when he lost his balance, tumbled to the ground and was crushed by the trailer being towed behind. There were also the alarming reports of a local farmer and his son who shot and killed more than 300 lions on their farm during the same period. This is particularly astounding because Golden Gate is now more than 800 km south of the present-day natural distribution range of lions. My favourite story is the description of the earth trembling beneath the hooves of countless migrating antelope; migrations rivalling those in modern-day Serengeti. And at the heels of these migrating megaherbivores: massive packs of wild dog. … or a hunter’s heaven? What happened to this species rich paradise? Where did all these animals disappear to in the last 150 years? To cut a long story short, these incredible herds were destroyed by human exploitation. During the mid- to late 19th century, a large part of the South African economy was made of the trade in animal hides. In 1870, 173 340 blesbok, wildebeest and zebra skins were exported via Durban Harbour. The following year, that number increased to 311 446 skins. The excessive exploitation of natural resources caused the downfall of one of the great biodiversity regions in Africa. It was joked at the time that even the vultures were overwhelmed by the wasteful practice of removing only the useable skins: they supposedly only fed on the eyeballs of the carcasses because they were unable to keep up with the mountains of flesh. Human exploitation undoubtedly ruined the biodiversity of Golden Gate. But what can we learn from this depressing recollection? The first impression would suggest that we, as a society, have not changed much in the past century and a half; if anything, we only gotten worse in our exploitation. Even though we might understand the need for conservation, conservationists, researchers, policy makers and governments all fear the negative socio-economic consequences of environmental protection. The Golden Gate case-study teaches us that we should not be scared at all. In 1872, hunting laws were established to ban the killing of animals for the trade in skins. I’m certain that this was not a popular decision at the time; especially considering that such a pronouncement basically destroyed a thriving market; leading to many people losing their livelihoods. But the people of time adapted and restructured their ways. Decades later on 16 October 1963 – after one Anglo-Boer War, Two World Wars and the independence of South Africa – farms of the region were (willingly, I might add) consolidated and Golden Gate was officially established as one of South Africa’s national parks. Since then, South Africa has restructured its laws to create one of the most progressive environmental legislation systems in the world. Society, as a whole, has benefited from the politically-challenging decisions made throughout the last 140 years. I love the lessons taught by the history of Golden Gate. First, it teaches us that once we destroy biodiversity, there is little we can do to get it back. The grasslands of the eastern Free State have not seen huge herds of migrating Wildebeest, prides of lions, or packs of wild dog for over a century; and their return has become increasingly unlikely. We should protect what we have. Second, just as I resent the greed of 19th century hunters today, future generations will judge us for the decision we are currently making. We should stop being short-sighted and start thinking about the long-term consequences of the legacy we choose to leave behind. Lastly, it is possible to destroy a sector of economy for conservation purposes without dire consequences. The hunting of animals for their hides was stopped in 1872, despite half a million animals being killed during the previous two years. South Africans survived without hunting-related livelihoods. They adapted. We can also adapt. We should look back at the legislators of the 1870s and follow their example. If history teaches us anything, it’s that we shouldn’t shy away from making tough decisions. This entry was posted in Environmental literature, Environmental politics, Ethics, History of conservation, People and conservation and tagged Biodiversity, Conservation, Ecology, golden gate highlands national park, History, Hunting, South Africa. Bookmark the permalink. In this day and age, I fear that very few people have the balls to make the tough decisions, even though they may believe it to be for the best in the long run. Thanks for the comment Rachel, but I’m not sure I agree with you. I think we (as a global society) are more conservation-minded than we have ever been at any time in our history. The trouble is that our impact has grown much faster than our ability to conserve nature… I think a prominent reason for this is because we have created a false dependency on our modern culture and economic structure. We assume that we wouldn’t be able to survive and function in any system other than the familiar status quo. My main message with the post is that we shouldn’t underestimate people’s ability to adapt to change. In 19th century South Africa, the major hunting industry was effectively collapsed within the space of a year. Sure, it probably pissed off a lot of people, but South Africans survived. Who says we can’t do the same? Are you sure you did not consider habitat fragmentation and, hence, animals’ inability to return to the now protected area? One place’s recreated conditions do not create “inhabitants” out of thin air…yes, it may have the right conditions, but no connections through which it can be accessed. The same goes for every biotope which has not been populated following recreation/restoration (or any other measure that has put a halt on damaging actions). For example, there are some studies regarding active river restoration which had recreating the physical template of the river as their objective. The purpose of active river restoration is to create the right physical conditions in order for the river to be repopulated. Where studies have found no link between river restoration and increased biodiversity it was because there were detrimental actions going on at the catchment level. Although it may seem idyllic to return an environment to its original status this can also be unrealistic, especially when there is a big time gap between the idyllic state of an area and the moment of habitat restoration…I guess, in the end, it boils down to the complexity of the new foodweb that has been created in the newly protected (and, possibly, restored) area and the ecosystem’s ability to sustain itself (that means the opposite of an ecosystem’s functionality to collapse 😛 ). And, yeah, people can adapt and, therefore, change their ways….but this is, and should be, also part of the biodiversity conservation programmes. Interesting comment, Diane, but it reflects something that bothers me about the wider culture of conservationists. We’re an idealistic bunch, and we tend to focus on how things ought to be, rather than how they really are. We see the glass as half-empty and dismiss the progress we have made as “not good enough”. While this perfectionism drives many conservationists, we shouldn’t be ashamed of celebrating conservation successes. You are 100% correct that classifying an area as “officially protected” doesn’t automatically mean that all the species that originally occurred there will magically return. You are also 100% correct that populations of plants and animals cannot establish in isolated protected areas. They need purpose-build migratory corridors of a permeable matrix for colonists. Nevertheless, the history of Golden Gate Highlands National Park – although far from perfect – remains a momentous achievement for conservation. Dismantling the hunting and animal-hide industry during the 19th century – arguably the biggest economic driver at the time – and proclaiming the area a national park less than 100 years later is an amazing conservation success. Can you imagine the same happening in, say, the present-day mining industry? I can’t. Governments would never allow it because they fear the social and political consequences of dismantling a major driver of the economy. The point I was trying to make with the original post was that governments and policy- makers should not shy away from making conservation-friendly decisions at the expense of the economy. It may be difficult, but it’s been done before. What are your thoughts on the potential for Rewilding Europe (http://www.rewildingeurope.com/)? I am from a mining state that exports raw material to some developed nations and then pays more to import finished goods. The challenge is not at the state level alone or even at the national level, but it is a global supply chain issue. So, I am unsure how can one district, state, or even a country make conservation-friendly decisions when borrowing/lending and other such decisions depend on tolerating or even collaborating to ravage Mother Nature. To your point: “…It may be difficult, but it’s been done before.” How difficult, in your view, has population explosion made conservation-friendly decision-making? We were not as many in those days as we are today. Furthermore, we have almost bloated in some countries that there is no space left for wildlife. When I was growing up, having wild trees and snakes were common; however, I do not see many around now. People plant “esthetically pleasing” trees (sometimes exotic ones) and claim that they are eco-friendly, but snakes have no voice here anymore. Even some conservationists support population explosion….so I am unsure…What do you think? Your comment has several important themes, many of which are well beyond my expertise. But this is the internet, so its okay for me to speculate about things I don’t know much about! I don’t know enough about the ‘Rewilding Europe’ program, but I am reasonably sure that conservation in Europe is fundamentally different to conservation in other developing areas (such as South Africa, my home country). I lived in Belgium for three years and my experience was that the general population are, on average, more educated and have more disposable income. Their values towards conservation are completely different to those in developing countries. I’m unsure whether the areas in the ‘Rewilding Europe’ are big enough to support the long-term persistence of populations, but the impression I get is that the program is willing to actively manage species at a sub-population level (based on molecular data) and spend great deals of money to ensure that populations remain viable even if it needs ex situ breeding and translocations. I’m dismissing a lot of nuanced discussion to make some broad-brush statements; please ignore if it is so general that it become meaningless. One thing that bothers me about conservation is not the general feeling of apathy, but rather hopelessness. I’ve suffered from this before and it stems from the idea that environmental problems are so big that they can only be solved using big, coordinated global solutions. While there is an element of truth in this assumption, it is practically useless because very few people have enough influence to change things globally. This type of thinking ultimately leads to inaction because we are intimidated by our own smallness. The global economy is a complex system. Yes, it may be true that the characteristics of this system is an emergent property that is ultimately insensitive to the dynamics of its constituent parts. However, I think it is more likely that this system is less robust than we think, and the small ripples in the constituent parts can cause major changes to overall system (think about the domino effect which lead to the last global financial crisis. Yes, population growth is an added pressure, but it is not an excuse for inaction. Please check out this blog post at Conservation Bytes . It outline the findings of a a recent paper, which studied human population growth in a conservation context. Their conclusions were quite simple, the population is not going to decrease any time soon, so although we should plan for population control now, we can’t expect it to be the solution of all our conservation woes. However, impact (I) is a function of population size (P), affluence (A) and technology (T) — I = P x A x T — so, we can still reduce the impact of humans by focusing on technology and affluence (per capital consumption). Yes, we need mining and other destructive industries, and we always will, but we should not blindly accept that we will need more and more of these development just because the population is growing. We must at some point accept that we need new technologies to reduce our reliance on old fashioned extraction economies or we will have to reduce our consumption. The example of Golden Gate outline in my post embodies this. Sure the pressures were not as high as they are today, but the politicians of the time made a decision to reduce the environmental impact by stopping consumption. I stick to what I said before: It is difficult, but it can be done. We’ve managed this before and we can do it again.